Perfect for a day trip, Kobe is a vibrant city with plenty of interesting history, culture and delicious cuisine for you to explore. Whether you prefer a fascinating museum, a refreshing hike, or just to move from café to restaurant in search of the best local treats, Kobe has something to interest every kind of traveller. We’ve rounded up some of the best things to do in the city if you’re only there for a short time and want to experience as much as possible of what Kobe has to offer. In 1995, Kobe suffered serious damage from the Hanshin earthquake, which affected much of the city and caused the port to collapse into the sea. As a major port city that relies on shipping for its trade and links to the outside work, this had a huge impact on Kobe. The country drew together to rebuild the port, but a small section was left in Meriken Park as a reminder of what the city has overcome. It’s well worth a visit while you’re visiting Kobe, the ruined port is very moving and the memorial has a little more information about the earthquake and its impact. At 108 meters high, the red scaffold-style exterior of Kobe Port Tower makes for striking viewing. Even better is the view from its observation deck, which looks out over spectacular panoramic views of the city. Its central location gives you a unique vantage point over the city, with the glittering water of the harbour on one side and the craggy mountains on the other. It is open every day between 9am and 6pm, although you might find the hours extended through over Christmas and the summer months. No trip to Kobe would be complete without seeing the beautiful Nunobiki Falls, considered to be one of the greatest among Japan’s ‘divine falls’. They have been represented many time in literature and art. Just twenty minutes from the Shin-Kobe Station, it’s an easy walk up the falls on easy, well marked trails. If you’ve still got some energy once you’ve seen the falls, head on up the mountain to see the city from the observation area. Kobe’s Nada district is famous for its sake brewing, with some of the world’s best sake produced in the area. There are plenty of breweries in the area, which is just a ten-minute bus ride from the centre, and most of them have museums or tours for you to enjoy. It is a great way to learn about the rich heritage of sake in Kobe, and to sample some of the delicious sake that is still made here! Impressively designed to look like the sails and rigging of a ship, even the architecture of the Kobe Maritime Museum is splendidly nautical. It opened in 1987 to commemorate the 120th anniversary of Kobe becoming a foreign Treaty Port at the end of the Edo Period. The entrance hall features a scale model of the British warship Rodney, which fired its guns at the opening of the port. Further exhibits on ship construction, cruise ships, and the turbulent history of the port are bound to keep you fascinated for hours. Be aware that it’s closed on Mondays unless it’s a public holiday. The Shin-Kobe ropeway starts next to the Shin-Kobe station and takes you right up to the observation deck at the top of Rokko mountain for the best views of the city. You’ll pass over the Nanobiki waterfalls, and the beautiful Nanobiki herb gardens on your way up. You should also visit the herb garden, which is Japan’s largest with 75,000 herbs and flowers blooming throughout the year. You can buy admission to the gardens alongside your ropeway ticket at the bottom of the mountain. People flock to Kobe to try the famous beef with the same name, so you should definitely try this delicacy whilst you’re there. Kobe beef comes from a special breed of cattle called Tajima-gyu, and is recognisable from its highly marbled appearance. Several restaurants in the city offer Kobe beef, often in a set menu featuring various cuts alongside different vegetables, soups, sauces and seasonings. It’s likely to be expensive, but worthy trying if you haven’t eaten Kobe beef before. These delicious Japanese dumplings are another delicacy that you must try during your trip to Kobe. Paper-thin dough is filled with meat and vegetables, then either boiled, fried, or deep fried depending on your preference. They make for the perfect snack or accompaniment to an authentic Japanese meal. You can find them all over the city, although many locals swear by established restaurants such as Hyotan near Hanshin Sannomiya Station. Kobe is known for its amazing coffee and was one of the first places to introduce cappuccinos to the Japanese public. Nishimura, located in an iconic German-style house, is credited with the feat and still serves up the best coffee in town. Coffee jelly is one of their many unusual creations and is often eaten as desert or alongside a cup of liquid coffee. It’s like nothing else you’ve ever tried, but it’s surprisingly refreshing. 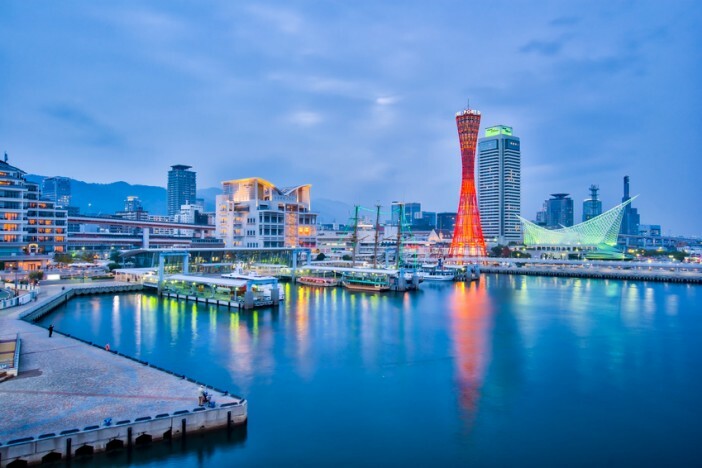 If this guide to the fascinating city of Kobe has got you interested in a Japanese adventure of your own, why not book on of Cruise1st’s amazing cruise deals? Browse the full collection online, or call our friendly team on 1300 857 345.